It’s a whimsical wonderland this season at KidZania Manila as it celebrates the National Novel Writing Month with “Once Upon a Halloweek,” where kids and adults can come in their favorite storybook or comic book character costume from October 27 to November 4. The whole family may enjoy specially themed activities such as taking Instagram-worthy photos in the revamped retro RK Clubhouse, breaking out of KidZkaban Prison, attending a Mad tea party, and a whole lot more. Watch out for sweet treasures in KidZania’s Treasure Island, a hunt for treats exclusively for B*KidZanian CitiZens, where candies, treats, and special items sponsored by Oishi, Toy Kingdom, Cebu Pacific, Pascual Lab, Green Cross, McDonald’s, Milo, and a lot more await participants. The higher the level of CitiZenship, the longer the hunt time! Plus, CitiZens get extra time when they come in costume. Meanwhile, kals may also get double pay or pay half at select National Book Store Book Quest establishments. They can write their own children’s story at the National Book Store, design storybook covers at the Art and Design Academy, keep the seas clean for our animal friends at the Marine Research Laboratory, help Mr. Wolf with his cough medicine at the Product Lab, and make an antidote for Snow White’s poisoned apple. Race enthusiasts may train like the Tortoise at the Fitness Lab; foodies can make delicious meals using green eggs at the Cooking School, and the whole KidZania community may help the Boy who cried Wolf get the advice he needs at the Radio Station. Best Kid Costume and Best Family Costume winners on October 31 to November 2 will receive special prizes from Toy Kingdom and Aruga by Rockwell and be a part of the special Halloween farewell parade. 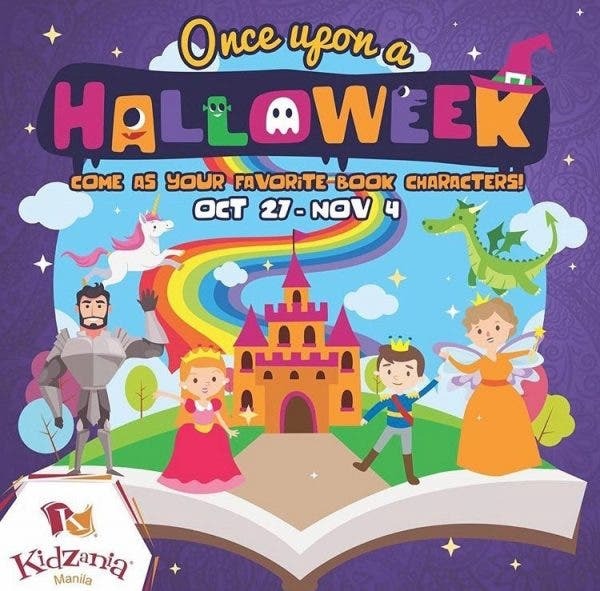 Enter a land of dreams and come in your favorite storybook or comic book character costumes in “Once Upon A Halloweek” at KidZania Manila, where families may enjoy specially themed attractions starting from October 27 until November 4. Tickets are priced at Php 900 to 1,100 for kids, Php 770 to 900 for adults, and Php 1,999 for the Happy 3-Day PaZZ, which allows one kid and one adult for three visits valid from October 4 to November 4. KidZania Manila is located at Park Triangle, Bonifacio Global City. For more details, visit manila.kidzania.com or follow the play city’s social media accounts (Facebook, Twitter, and Instagram) @kidzaniamanila.